Church Road, Portfield, Chichester, West Sussex. Grid reference: 487880, 104990, View on: Google Maps, Open Street Map, Streetmap, National Library of Scotland Map or Oldmaps. There are 145 baptisms in the OPC database. IGI Batch: C070901 (1871 ~ 1876). IGI Batch: M070901 (1871 ~ 1876). 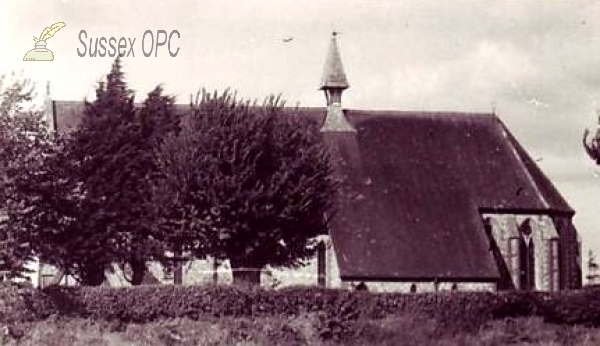 There are 4 images of this church in the OPC database. Style: Lancet in flint with brick and stone dressings. Apse & Lady Chapel added in 1915. The church of ALL SAINTS, PORTFIELD, lies on the east of Church Road opposite the burial ground. It was built in 1871, of flint with stone dressings, and has a tiled roof. It is designed in the 13th-century style, and consists of a nave and chancel with vestry on the north, a chapel on the south side and a porch at the west end of the south wall. From: 'Chichester: Churches (Anglican)', A History of the County of Sussex: Volume 3 (1935), pp. 160-164. URL: http://www.british-history.ac.uk/report.aspx?compid=41675. Date accessed: Wednesday, October 10, 2007..